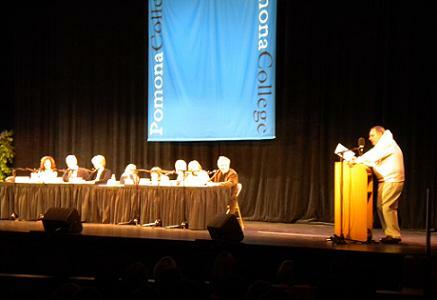 The “Says You!” syndicated radio game show taped two episodes at Claremont’s Bridges Auditorium on Saturday. Yours truly was there. Read about the show in Wednesday’s column. While checking a few facts about the Pomona College trivia referenced in the show’s questions, I found this fun links page from the college about various bits of “Pomoniana”: the mystery of 47, the sagehen mascot, Ski-Beach Day, etc. Check it out. I wish I could have been there for the taping. “Says You” is a terrific program, an outstanding mixture of word play, intellectual challenge and humor. I can only imagine the atmosphere they encountered at Bridges, far different from even their previous visit to Pasadena City College. David, please try to alert us to the scheduled dates we can hear these shows.